Hardly anyone notices this venerable pump of 1832 in Shoreditch churchyard, yet this disregarded artifact may conceal the reason why everything that surrounds it is there. 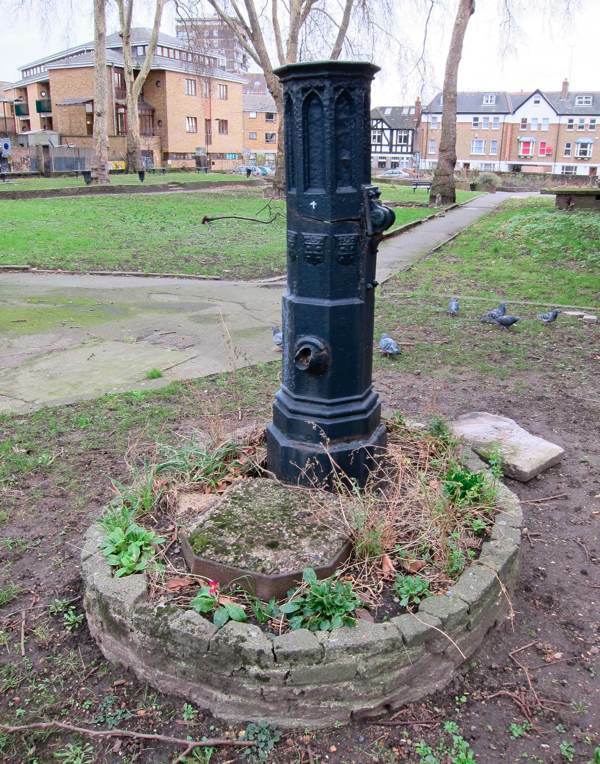 Reverend Turp of St Leonard’s explained to me that the very name of Shoreditch derives from the buried spring beneath this pump, “suer” being the Anglo-Saxon word for stream. The Romans made their camp at this spot because of the secure water source and laid out four roads which allowed them to control the entire territory from there – one road led West to Bath, one North to York, one East to Colchester and one South to Chichester. In fact, this water source undermined the foundations of the medieval church and caused it to collapse, leading to the construction of the current building by George Dance but, even then, there were still problems with flooding and the land was built up to counteract this, burying the first seven steps out of ten at the front of the church. Later, human remains from the churchyard seeped into this supply (as in some other gruesome examples) and it was switched over to mains water. 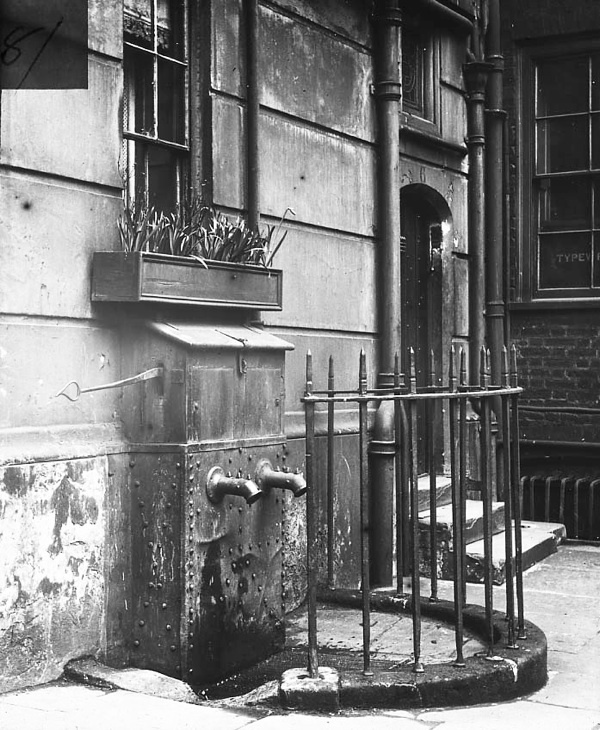 Today, the sad old pump in Shoreditch has lost its handle, had its nozzle broken and even its basin is filled with concrete, yet a lone primrose flowers – emblematic of the mystic quality that some associate with these wellsprings, as sources of life itself. 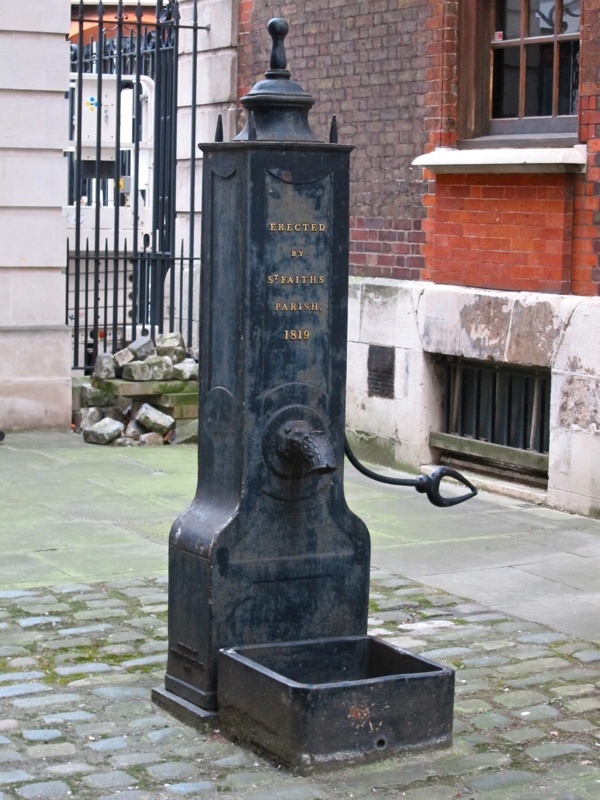 Before the introduction of the mains supply in London, the pumps were a defining element of the city, public water sources that permitted settlement and provided a social focus in each parish. Now, where they remain, they are redundant relics unused for generations, either tolerated for their picturesque qualities or ignored by those heedless of their existence. When I began to research this subject, I found that no attention had been paid to these valiant survivors of another age. So I set out West to seek those other pumps that had caught my attention in my walks around the city and make a gallery for you of the last ones standing. Holborn is an especially good place to look for old pumps, there I found several fine examples contemporary with the stately Georgian squares, and the Inns of Court proved rewarding hunting ground too. 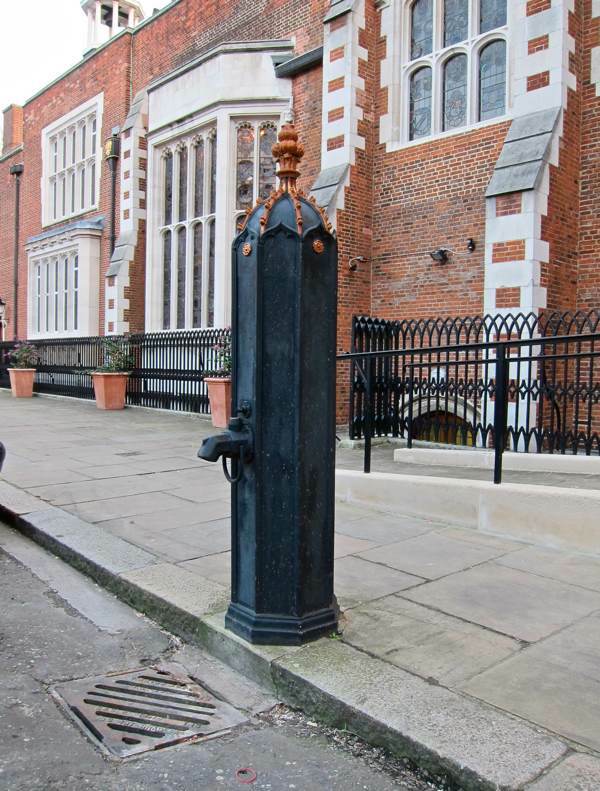 At Lincoln’s Inn, the porter told me they still get their water supply untreated from the Fleet river, encouraging me to explore South of Fleet St at the Temple, although to my disappointment Pump Court no longer has a pump to justify its name. 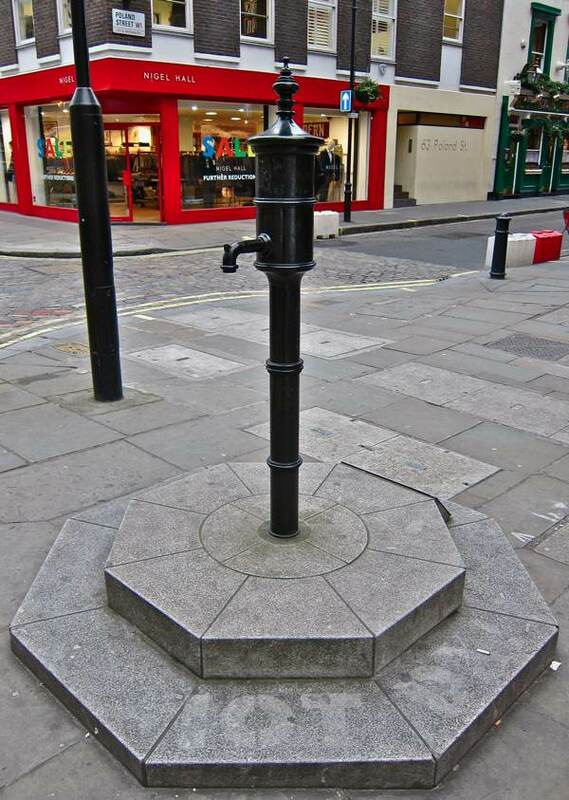 Up in Soho, at Broadwick St, you will find London’s most notorious pump, the conduit that brought a cholera epidemic killing more than five hundred people in 1854. Now it has been resurrected as a monument to the physician who detected the origin of the infection and had the pump handle removed. Today, the nearest pub bears his name, John Snow. 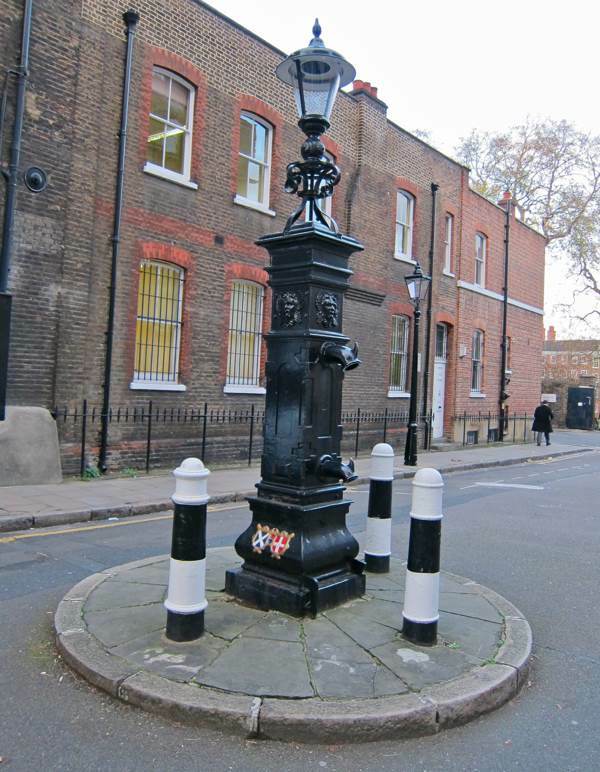 The East End’s most famous specimen, the Aldgate Pump – that I have written of elsewhere in these pages – was similarly responsible for a lethal epidemic, underlining the imperative to deliver a safe water supply, an imperative that ultimately rendered these pumps redundant. 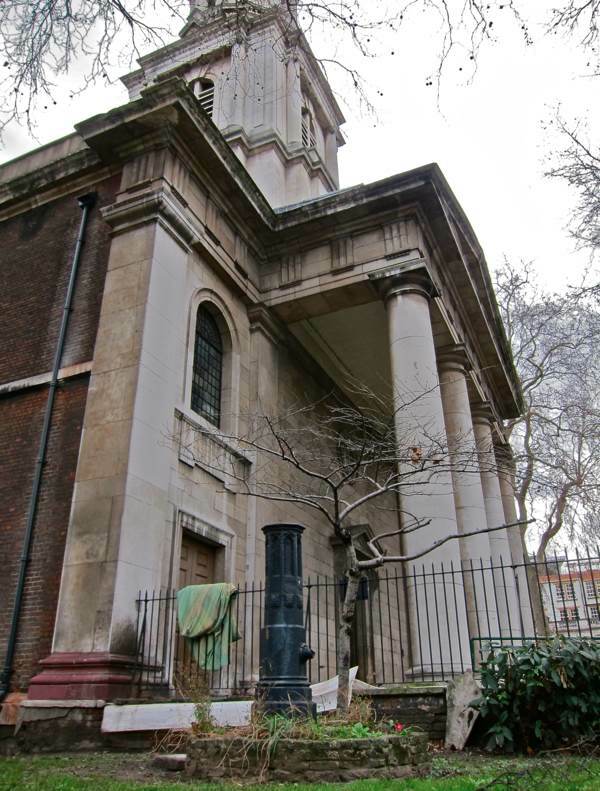 Perhaps the most gracious examples I found were by St Paul’s Cathedral, “Erected by St Faith’s Parish, 1819,” and in Gray’s Inn Square. Both possess subtle expressive detail as sculptures that occupy their locations with presence, and in common with all their pitiful fellows they stand upright like tireless flunkies – ever hopeful and eager to serve – quite oblivious to our indifference. In Shoreditch churchyard, this sad old pump of 1832 has lost its handle, had its nozzle broken and basin filled with concrete, and is attended by a lone primrose. 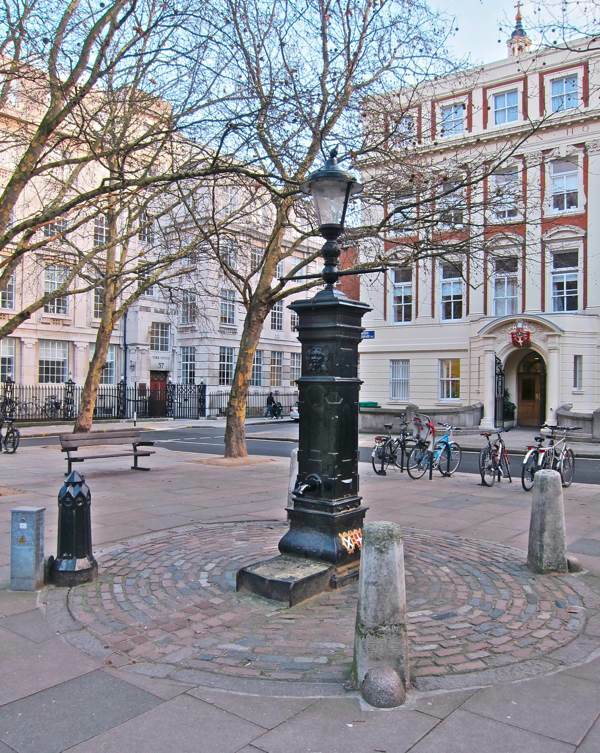 In Queen’s Sq, Holborn this pump of 1840 has the coats of arms of St Andrew and St George. In Bedford Row, Holborn, this is contemporary with its colleague in Queens Sq. In Gray’s Inn Sq – where, in haste, a passing lawyer mislaid a red elastic band. This appealing old pump in Staple Inn is a pastiche dated 1937. This is the previous pump in the location above, more utilitarian and less picturesque. In New Square, Lincoln’s Inn. Between Paternoster Sq and St Paul’s Churchyard. Outside the Royal Exchange in Cornhill. 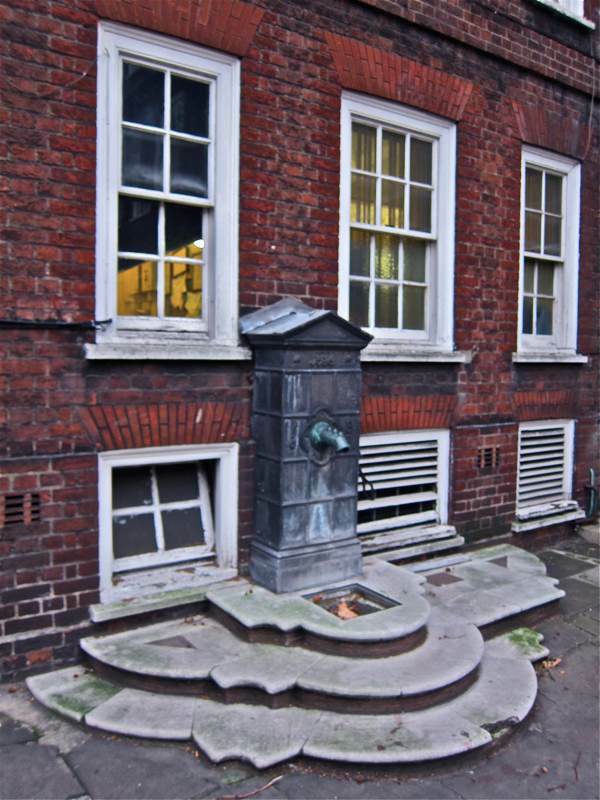 The text on the pump reads, “On this spot a well was first made and a house of correction built thereon by Henry Wallis Mayor of London in the year 1282.” Designed by architect Nathaniel Wright and erected in 1799. 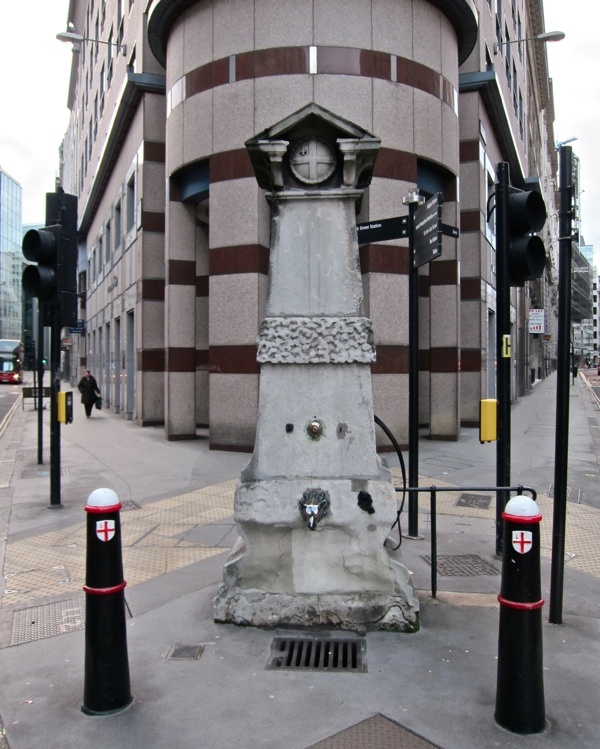 Aldgate Pump marks the boundary between the East End and the City of London. The faucet in the shape of a wolf commemorates the last of these beasts to be shot outside the walls of the City. London’s most notorious pump in Broadwick St, Soho. 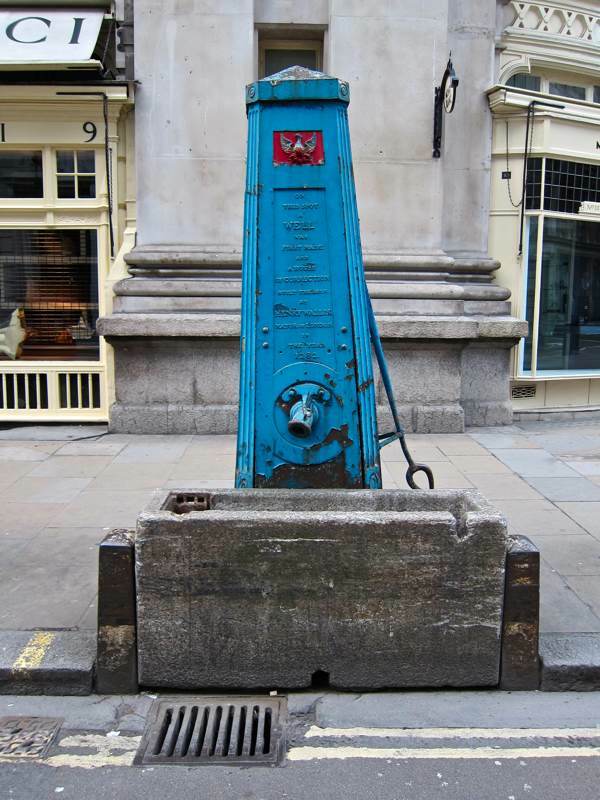 Five hundred people died in the cholera epidemic occasioned by this pump in 1854. Reinstated in 1992 to commemorate medical research in the service of public health, the nearby pub is today named “John Snow” after the physician who traced the outbreak to this pump. A red granite kerbstone across the road marks the site of the original pump. Oh! I was hoping that you’d have a shot of the Broadwick St. pump. Last time I was in London, I tried finding it, but ran out of time/light. Next time for sure. So fascinating – I love all the history of London that you incorporate. Do you know I don’t recall ever having seen any of these pumps! How unobservant of me, I shall be looking for them now. 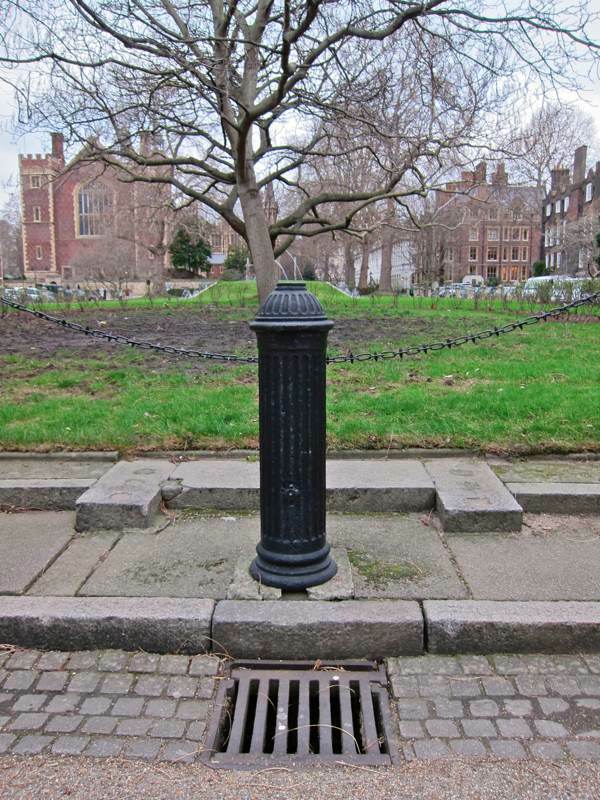 With regard to the Soho pump, one should also remember the great Sir Joseph Bazalget civil engineer who designed and implemented the sewage and drainage system of London in the late 1850′s, ridding London of it’s localised and stagnant water supplies. This came about as a result of not only the cholera outbreak but the of ‘the great stink of London’ which appeared to emanate from the River Thames and affected the members of Parliament when the House sat during the hot weather! I wish some of these could be connected to the mains to regain a life as drinking water fountains. I’d be interested to know if there are any working public drinking fountains in London? Like the distinctive green examples in Paris they’d be a real boom on a hot day and would undoubtedly reduce some of the unnecessary waste bottled water causes. Although I imagine it’d take a considerable PR campaign to get people to learn where they are and actually use them. Alice I’ve always wished that too. Carrying a bottle of water is such a pain when just a sip is needed to refresh. now and again. I’m sure there used to be some around when I was a nipper, in parks at least. Amazing!!! i would have walked past these pumps a billion times not realising why they are here or perhaps even that they are pumps! Just wondered into your blog and its one of my top lists now! keep it coming! Here on the Isle of Wight we have annual well dressing events when the ancient water wells are lavishly decorated with images made from flowers. When I looked at these photos I thought how great they would look decorated and celebrated in the same way. I think the Porter at Lincoln’s Inn may well have been pulling your leg. The Fleet is a combined sewer for most of its short length, emptying into several interceptors before finally reaching the Thames, the water is *definitely* not for drinking!